What if you could have the greatest ice cream flavors from any of the 50 states in your kitchen? 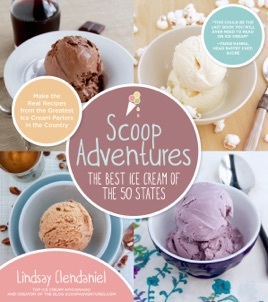 With Scoop Adventures by Lindsay Clendaniel, you'll have the recipes from the best shops in New York, Maryland, Illinois, Hawaii and everywhere in between. Lindsay Clendaniel, creator of Scoop Adventures, has found the best creameries from across the country and adapted their authentic recipes so you can make them in your own ice cream maker for your friends and family. With over 80 recipes from all over the US, tried and tested for your kitchen, there is sure to be a flavor for every mood and every taste preference. With the stories behind the flavors, colorful photos of the shops and most importantly, tasty and one-of-a-kind recipes, you'll have everything you need to scoop your way across America's best flavors.